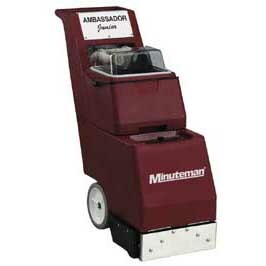 The MINUTEMAN AMBSSADRJR C45014-01 is an electric carpet extractor. This unit works in three different steps. Three spray jets push the cleaning solution into the carpet; independently powered brush cleans and the vacuum picks up all the dirty solution leaving the carpet clean and virtually dry. The MINUTEMAN AMBSSADRJR C45014-01 has easy to use features and a user friendly control panel. The polyethylene surface will not dent, corrode or rust with time, saving money on equipment costs.